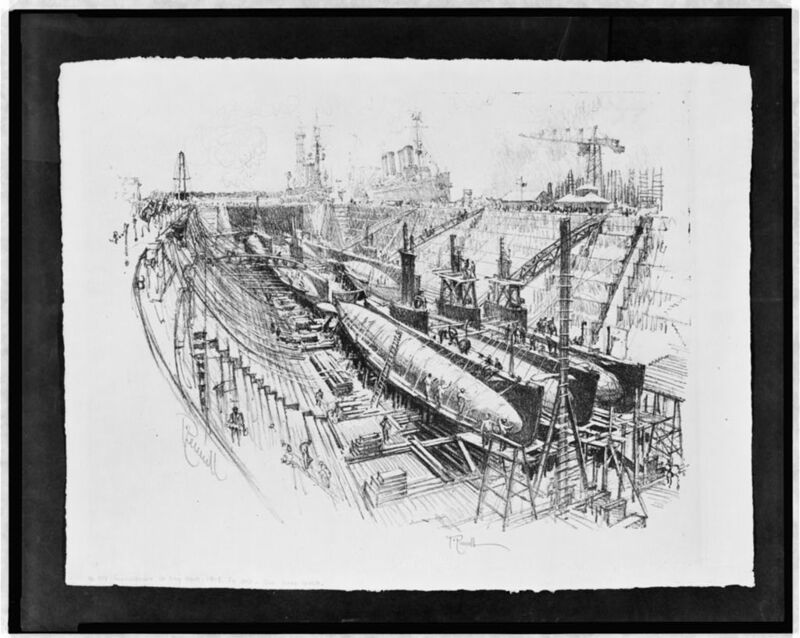 L-1 Class Submarine: Laid down, 23 March 1914, at Fore River Shipbuilding Co., Quincy, MA. 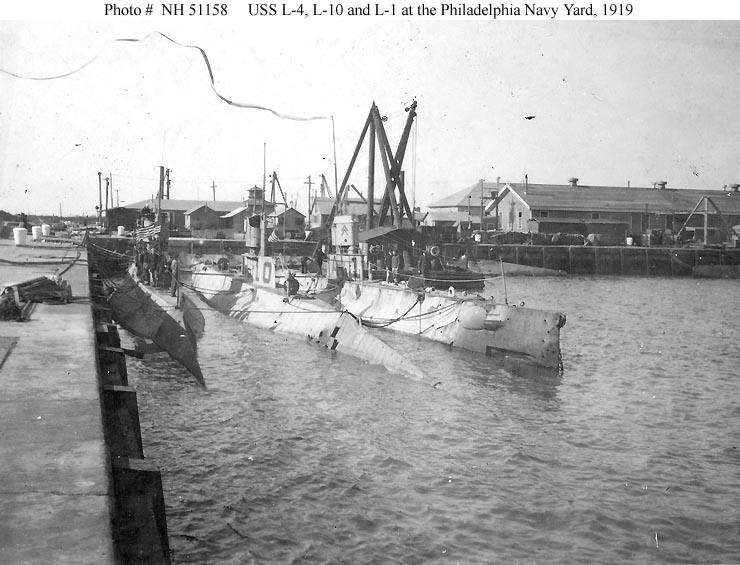 ; Launched, 3 April 1915; Commissioned, USS L-4, 4 May 1916; Designated (SS-43), 17 July 1920; Decommissioned and simultaneously struck from the Naval Register, date unknown, at Philadelphia, PA; Final Disposition, sold for scrapping, 31 July 1922, to Pottstown Steel Co., Douglasville, PA. Specifications: Displacement, Surfaced: 450 t., Submerged: 548 t.; Length 167' 5"; Beam 17' 5"; Draft 13' 7"; Speed, Surfaced 14 kts, Submerged 10.5 kts; Depth Limit 200'; Complement 2 Officers, 26 Enlisted; Armament, four 18", torpedo tubes, 8 torpedoes, one 3"/23 deck gun; Propulsion, diesel-electric, New London Ship and Engine Co. diesel engine, HP 900, Fuel Capacity, 18,977 gal., Electro Dynamic Co. electric motor, HP 680, Battery Cells 120, single propeller. 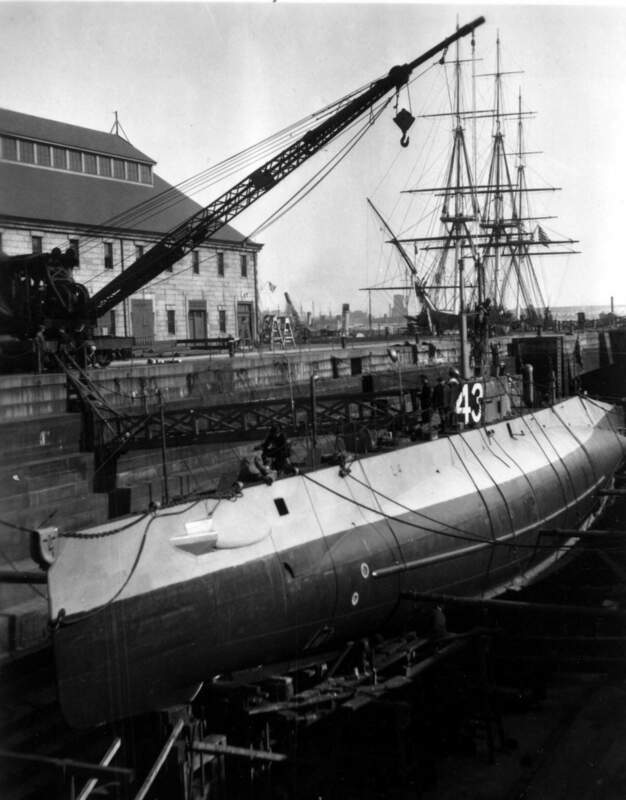 365k L-4 (SS-43) is seen in Dry Dock 1 of the Boston Navy Yard ca. 1916-17. The Constitution can be seen in the background. 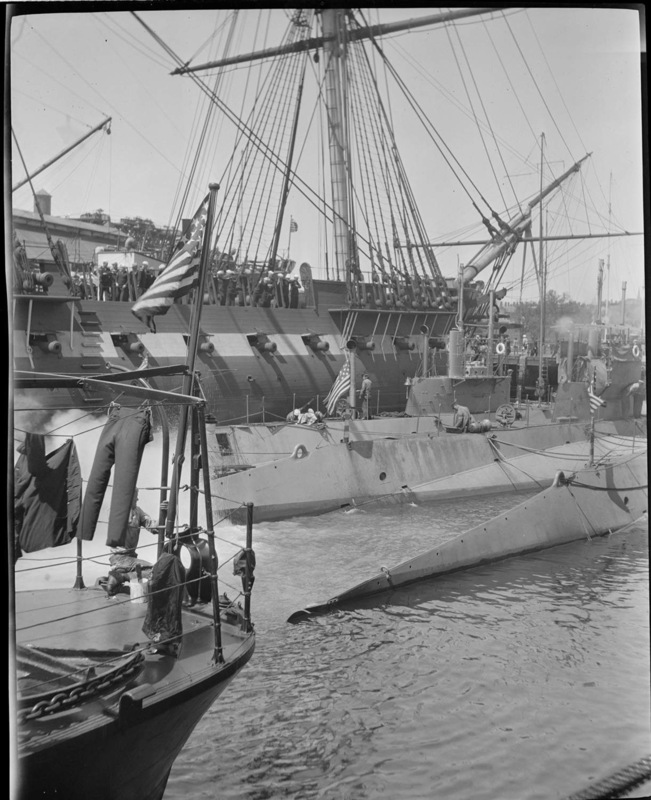 USN photo from the National Park Service, Boston National Historical Park, cat. no.BOSTS-11689, courtesy of Stephen P. Carlson, Preservation Specialist, Boston NHP, Charlestown Navy Yard. 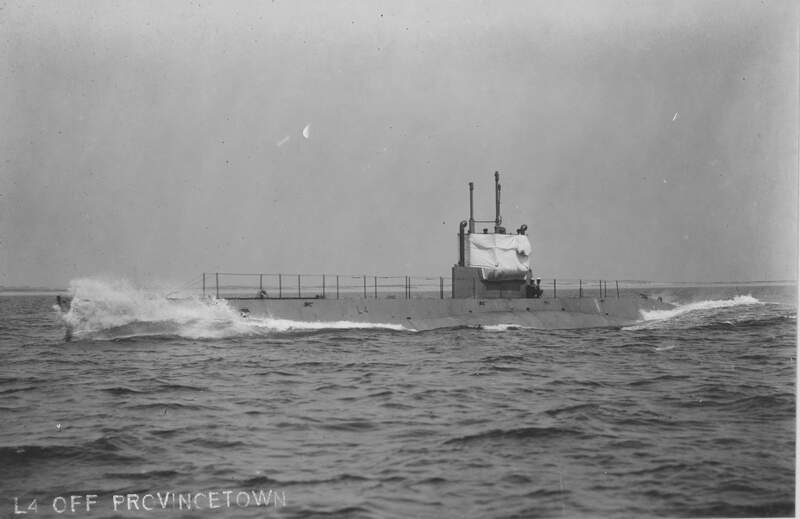 59k E-1 (SS-24) inboard & L-4 (SS-43), probably taken between 4 December 1917 & 12 January 1918, when both boats left Newport R.I. for the Ponta Delgada in the Azores, protecting the islands from German attack and use as a haven by U-boats. USN photo courtesy of Robert M. Cieri. 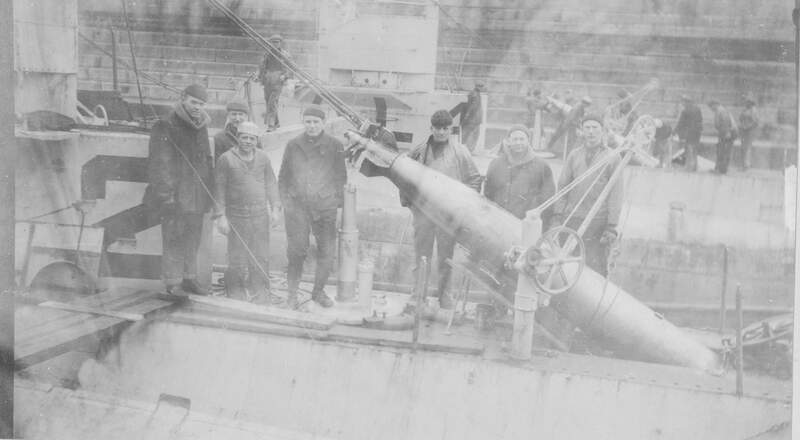 366k Loading a MK7 Bliss-Leavitt torpedo aboard the drydocked submarines L-2 (SS-41) & L-4 (SS-43) when they were based at Bantry Bay, Ireland, between January 1918 & 1919. The MK7 was 17.7 inches diameter and 17 feet long & weighed 1628 pounds. Photo & text i.d. courtesy of Ric Hedman. 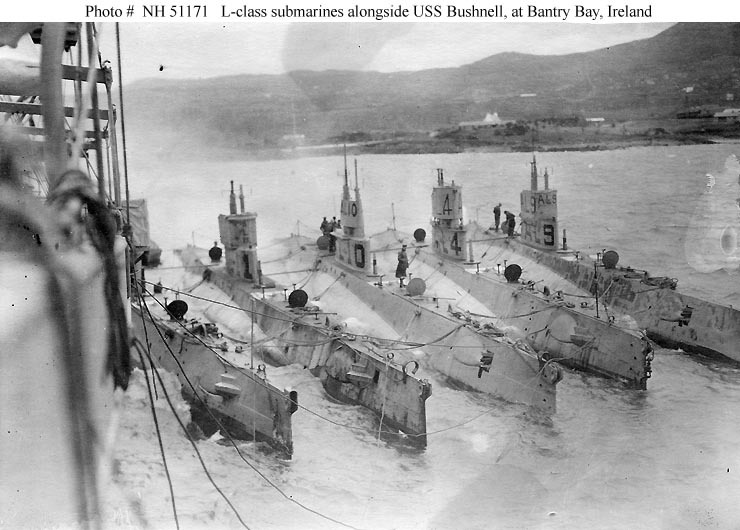 600k "L" class submarines probably alongside Bushnell (AS-2) at Bantry Bay, Ireland, in 1918. L-3 (SS-42), L-1 (SS-40), L-10 (SS-50), L-4 (SS-43), L-9 (SS-49). USN photo # Lot-5410-23, Secretary of the Navy Josephus Daniels Collection. Photographed through Mylar sleeve. Courtesy of the Library of Congress via National Museum of the U.S. Navy via flickr.com. 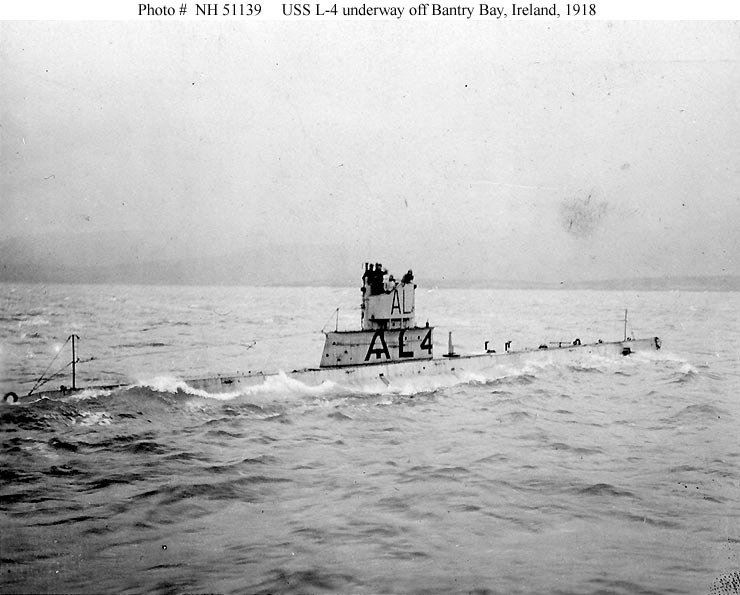 71k L-4 (SS-43) underway in 1918, probably in Bantry Bay, Ireland. USN photo # NH 51137, from the collections of the US Naval Historical Center. 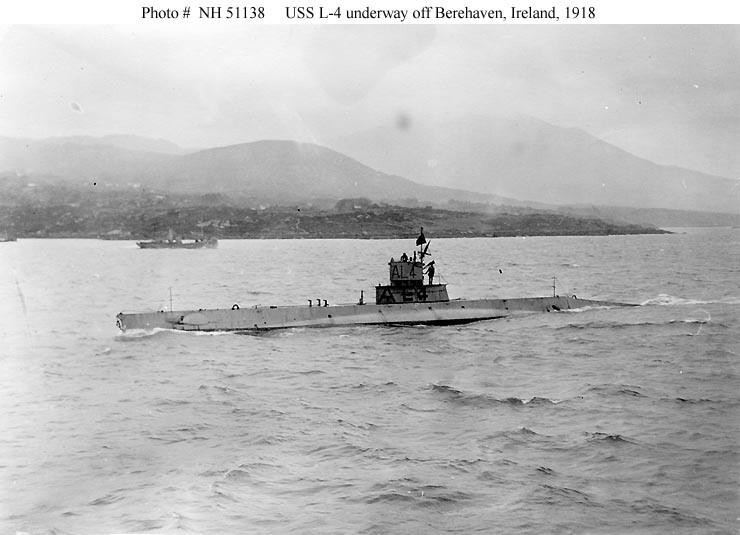 57k L-4 (SS-43) off Berehaven, Ireland, in 1918. USN photo # NH 51138, from the collections of the US Naval Historical Center. 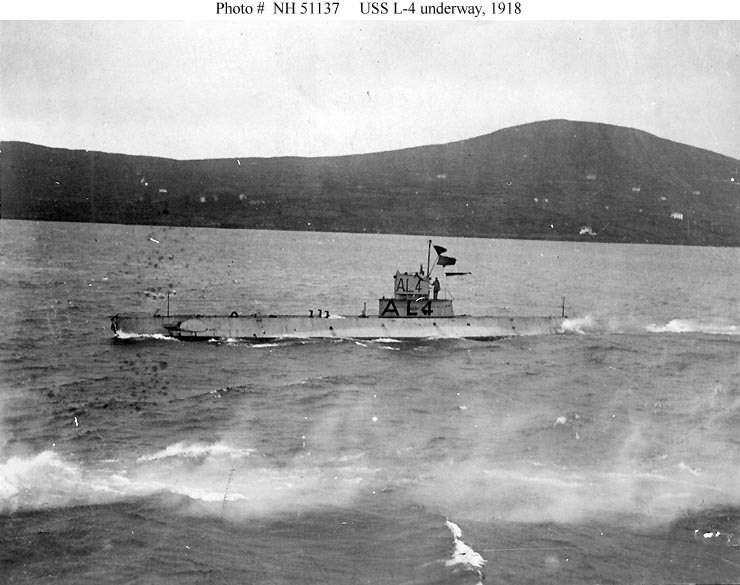 71k L-4 (SS-43) underway off Bantry Bay, Ireland, in 1918. USN photo # NH 51139, from the collections of the US Naval Historical Center. 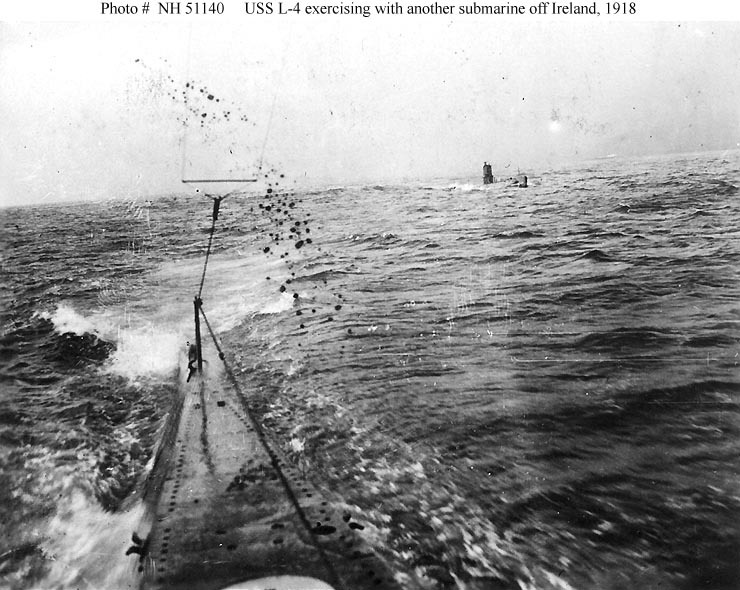 104k L-4 (SS-43) in right center background, exercising with another submarine off Ireland, in 1918. USN photo # NH 51140, from the collections of the US Naval Historical Center. 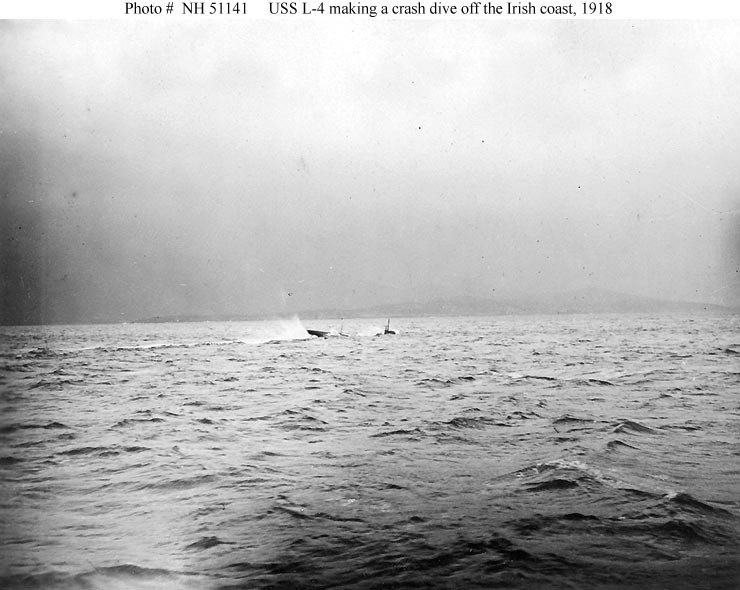 73k L-4 (SS-43) making a crash dive off the Irish coast, 1918. USN photo # NH 51141, from the collections of the US Naval Historical Center. 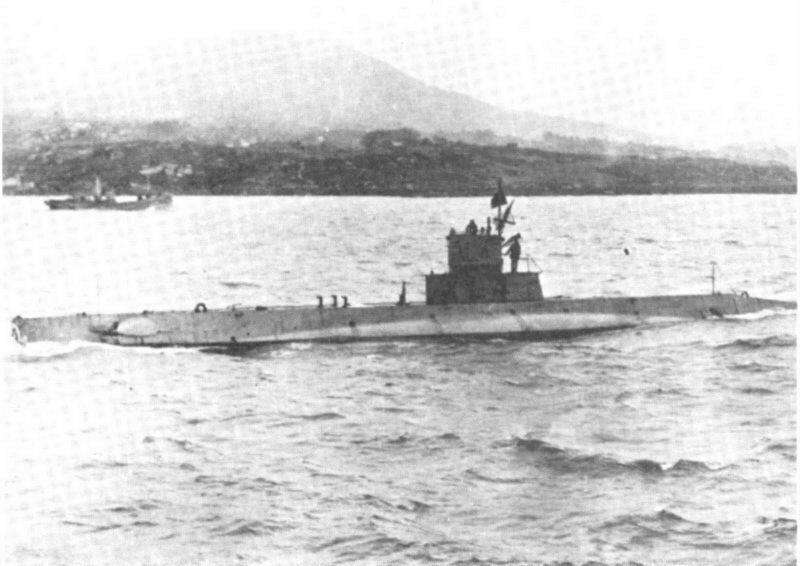 63k L-4 (SS-43), at Berehaven, Ireland. The L-4 was based here beginning 27 January 1918. USN photo contributed by Mike Green. 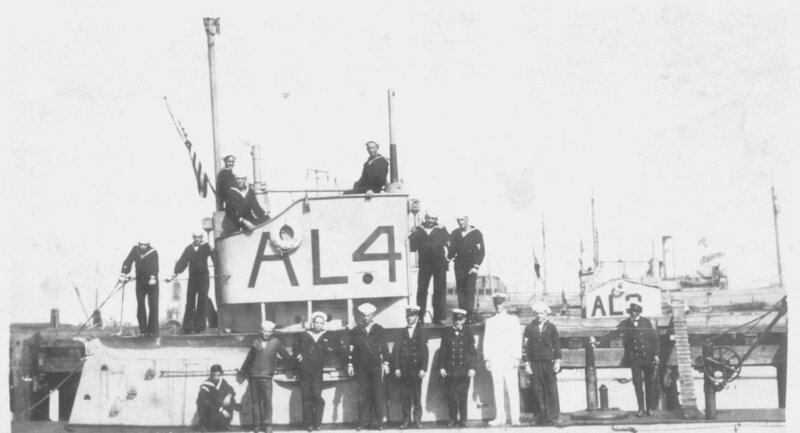 113k L-4 (SS-43), crew photo, circa 1918, place unknown. Note L-2 (SS-41), just visible in the background. Vance Adams for his father, Lt. Vance Adams USN Ret (deceased). 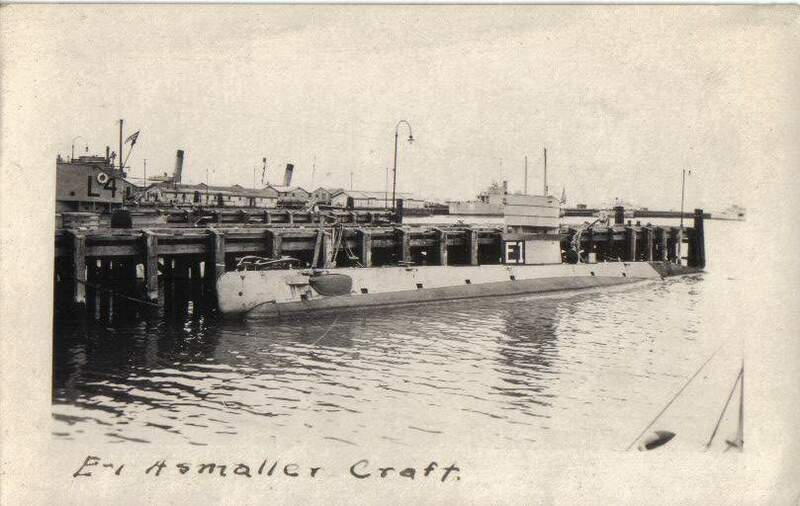 572k AMERICAN SUBMARINES home again from foreign waters lying in the sheltered basin at League Island. Photo & text by Evening Public Ledger. 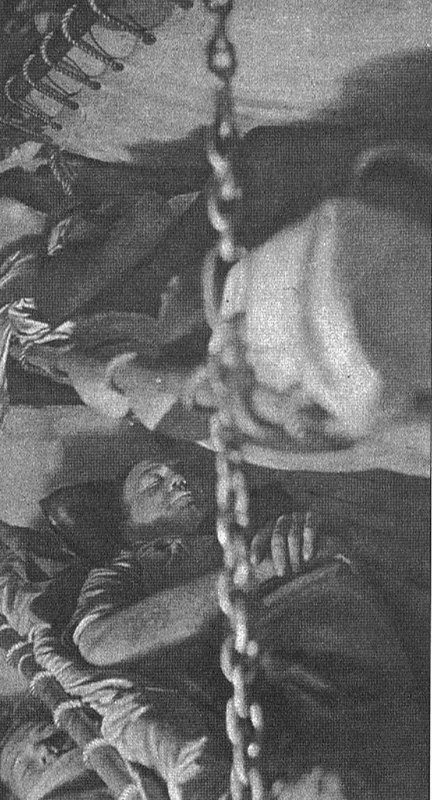 (Philadelphia [Pa.]) 1914-1942, 4 February 1919, Night Extra, Image 20, courtesy of chroniclingamerica.loc.gov. They display the most important war modifications: the permanent open chariot bridge & retractable (housing) periscopes. L-10 shows three fixed-spot hydrophones forward, presumably comprising a K-tube. Partial text courtesy of U.S. Submarines Through 1945, An Illustrated Design History by Norman Friedman. Naval Institute Press. USN photo NH 60252, from the collections of the US Naval Historical Center. L-9 (SS-49). U.S. Naval Historical Center Photograph, # NH 51171. Note the smoke from the submarines' engines. U.S. Naval Historical Center Photograph, # NH 51170. 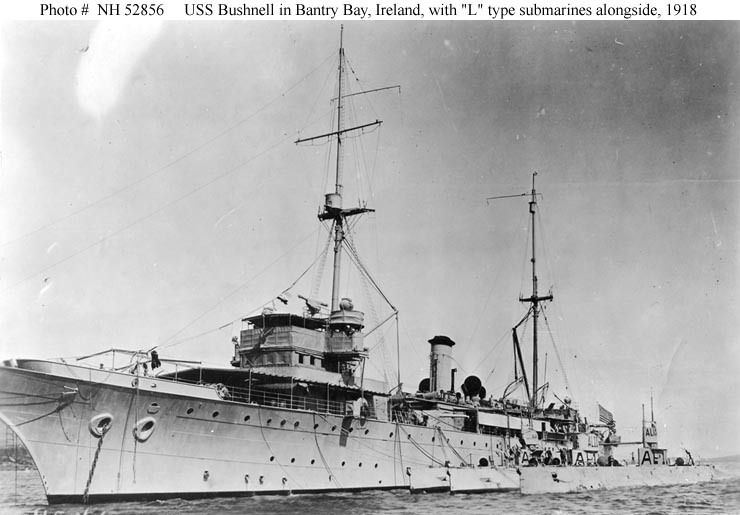 61k Bushnell (AS-2) at anchor in Bantry Bay, Ireland, 1918. 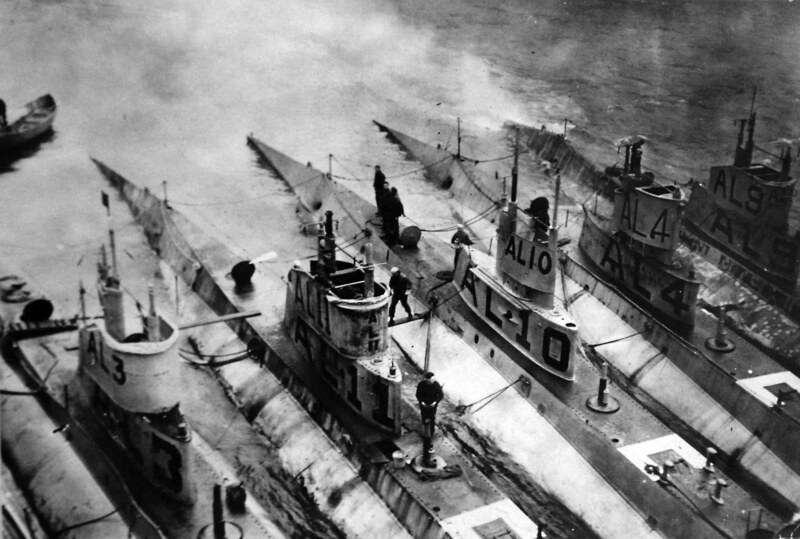 The submarines alongside are (from left to right): L-4 (SS-43); L-11 (SS-51); and L-10 (SS-50). USN photo # NH 52856, from the collections of the US Naval Historical Center. Collection of Rear Admiral Harold F. Pullen, USN. Loaned via Captain Paul B. Ryan, USN (Retired), 1977. 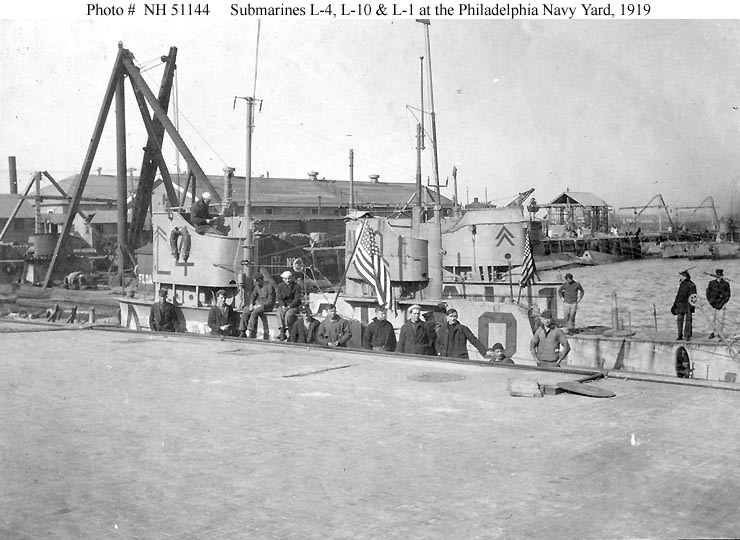 At the Philadelphia Navy Yard, Pennsylvania, soon their 1 February 1919 return to the U.S. from European waters. Note what appears to be a very long "homeward bound" pennant flying from the top of L-1's (SS-40), periscope. U.S. Naval Historical Center Photograph, # NH 51158. 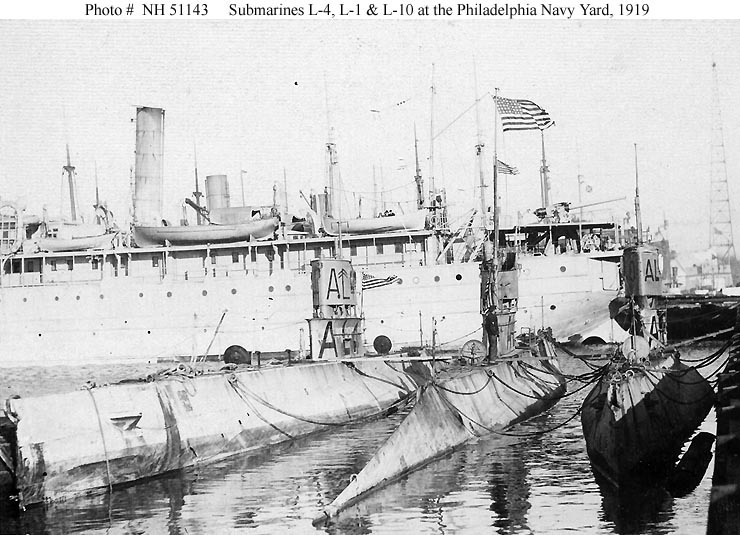 At the Philadelphia Navy Yard, Pennsylvania, soon their 1 February 1919 return to the U.S. from European waters. 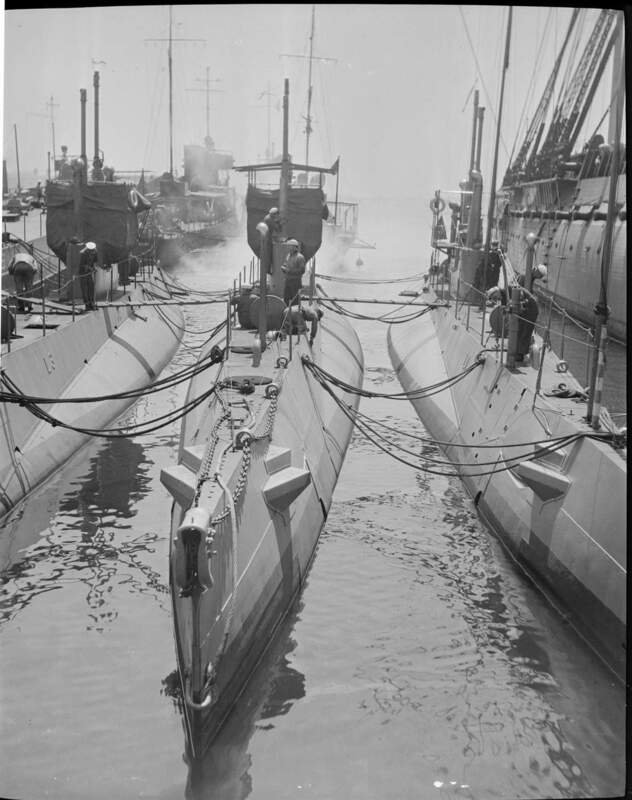 Note chevrons painted on the submarines' fairwaters, signifying World War I overseas service. U.S. Naval Historical Center Photograph, # NH 51144. 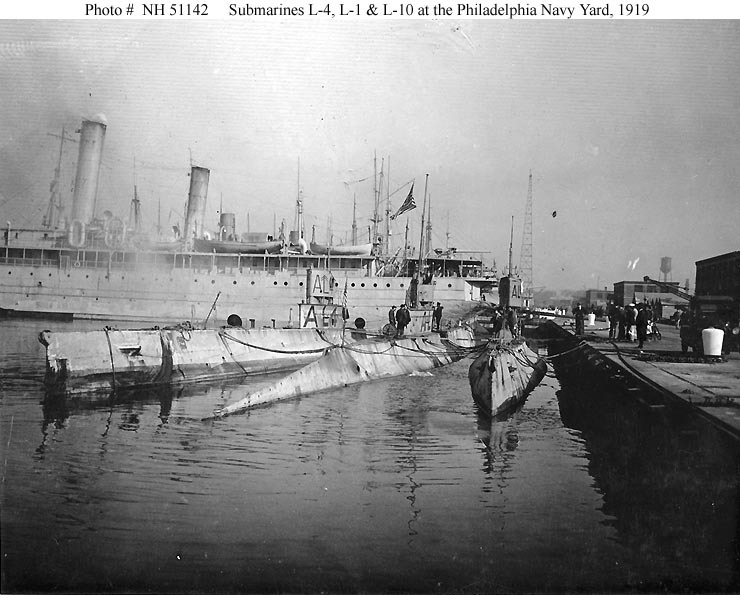 At the Philadelphia Navy Yard, Pennsylvania, soon their 1 February 1919 return to the U.S. from European waters. 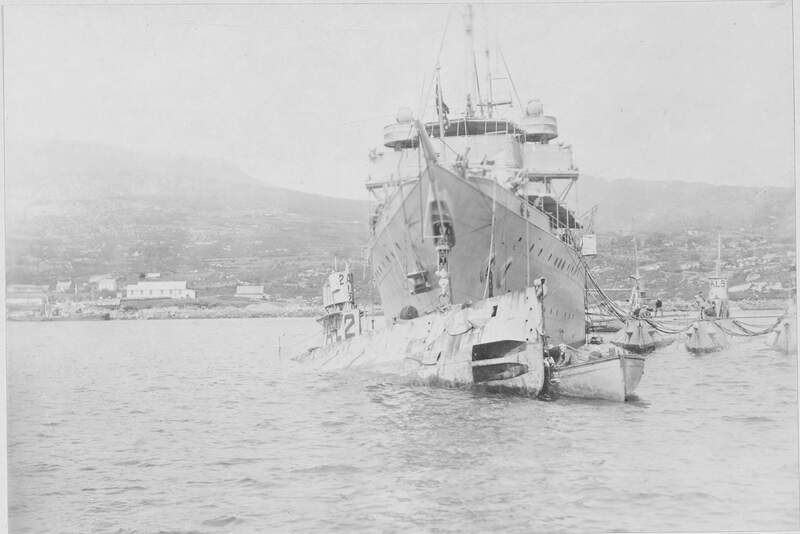 Ship in the immediate background is either Quinnebaug (ID-1687) or Saranac (ID-1702), with the other of the two beyond her. U.S. Naval Historical Center Photograph, # NH 51142. At the Philadelphia Navy Yard, Pennsylvania, soon after their 1 February 1919 return to the U.S. from European waters. Ship in the immediate background is either Quinnebaug (ID-1687) or Saranac (ID-1702), with the other of the two beyond her. U.S. Naval Historical Center Photograph, # NH 51143. 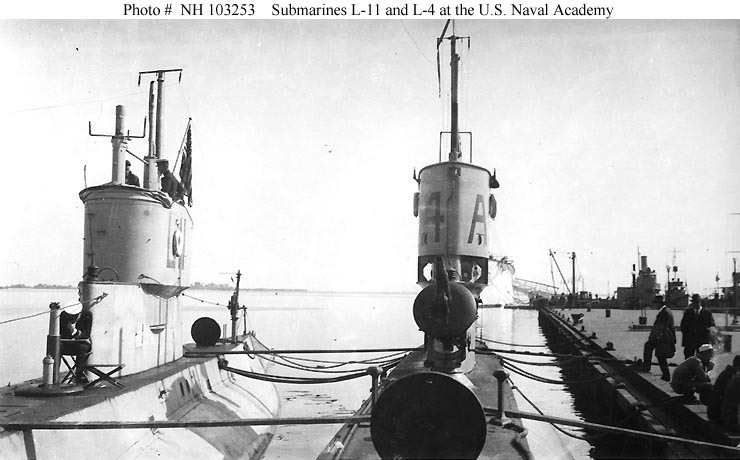 59k L-11 (SS-51), at left, and L-4 (SS-43) at the U.S. Naval Academy, Annapolis, Maryland, circa 1919. Note these submarines' 3"/23 deck guns, located just forward of their fairwaters. L-11's is retracted, while that of L-4 is in operating position. USN photo # NH 103253, from the collections of the US Naval Historical Center. Collection of Rear Admiral Harold F. Pullen, USN. Loaned via Captain Paul B. Ryan, USN (Retired), 1977. 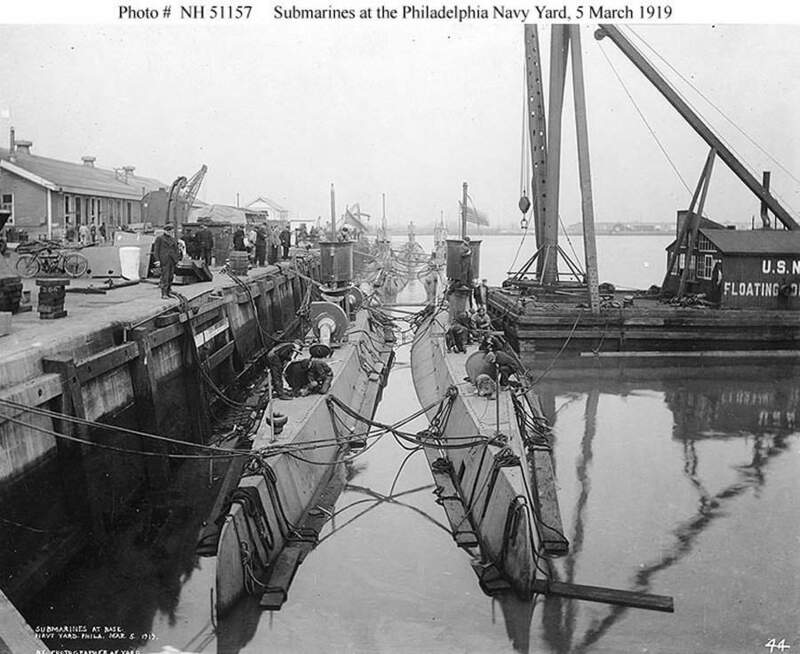 832k D-3 (SS-19), at left, and D-2 (SS-18) center at the Philadelphia Navy Yard, Pennsylvania, 5 March 1919, with shipyard workmen on board. Note the ventilating fans on D-3's deck. A derrick barge is alongside D-2. 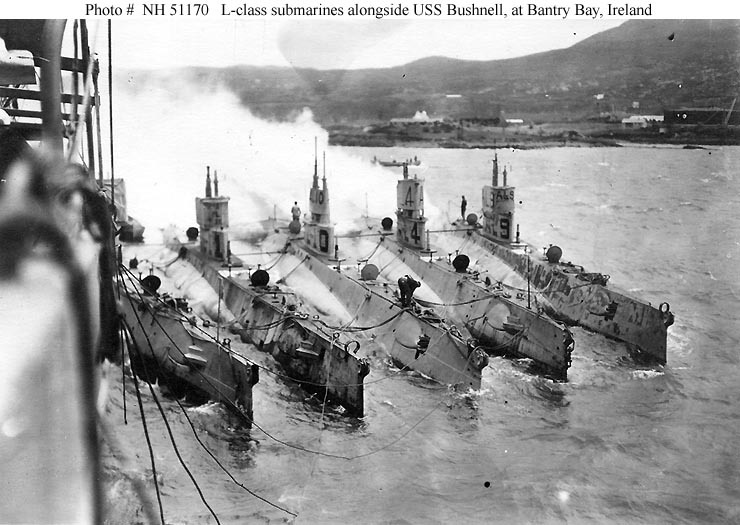 Among the four submarines visible in the background are L-1 (SS-40), L-4 (SS-43) and L-10 (SS-50). A motorcycle is parked at the far left. U.S. Naval Historical Center Photograph # NH 51157. 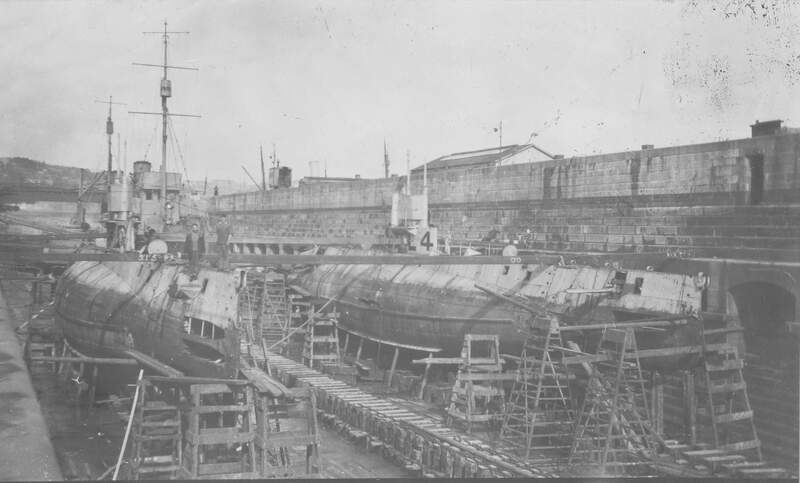 705k Submarines right to left are L-3 (SS-42), L-4 (SS-43) & L-1 (SS-40) to Constitution at Boston Navy Yard, circa 1918-20. Photo i.d. courtesy of Ric Hedmen.